HABIT & HOME: Happy Birthday Little Blog! I can't believe that today marks Moon Face's 1 year anniversary! When I started this, I had no idea what I was doing...I was just bored and wanted a little space of my own, to write and share whatever I wanted. It quickly took a new direction after the first couple posts and I fell in love with blogging! I have met some amazing and very talented people through the blog world, and am so grateful to have obtained so many wonderful readers myself! I love being able to connect with you all! You guys really are the best! Anyways, Happy Birthday little blog of mine! Yeah for Blog Birthdays!! Happy Happy Bloggy Birthday! Happy Birthday Moon Face! Your blog has come such a long way in just one year! I hope that mine can be as inspirational as yours in one year! 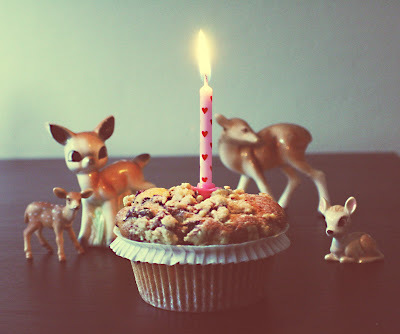 Happy Birthday to a sweet little blog! Oooo, happy bloggy birthday! Mine is in May, and I'm very excited. It's amazing how far a blog can come in a year and how it feels like something you have always been doing! Congratulations Cassie. You really have such a beautiful blog, I can't believe it's only a year old. You really should be proud of yourself missus! Happy Blog Birthday! So glad to be reading!